unfolding in the heart of Europe. At the tender age of 7, Marcos is sold by his father to a goatherd and taken to live to the Valley of Silence, a remote area of the Sierra Morena Mountains, in Spain. There, Marcos will discover the secrets of the wild. However, once the old goatherd dies, the young boy will have to survive alone in the woods for 12 years, becoming the leader of a pack of wolves. ENTRE LOBOS is a feature film based on the extraordinary life of Marcos Rodríguez Pantoja, who was born in 1946 in the northern province of Cordoba, in the heart of the Sierra Morena Mountains. When Marcos turned seven, he was sold by his father to a goatherd in a remote valley of the Sierra Morena Mountains, known today as the Natural Park of Cardeña and Montoro Sierra. When the old goatherd dies, Marcos lived alone in complete isolated. For 12 years, from 1954 to 1965, he had no human contact and lived with a pack of wolves. Marcos once said: “I was the King of the Valley”. He never adapted to society and his only true dream was to return and live… ENTRE LOBOS (Among Wolves). Marcos never imagined that his life was to change so abruptly one spring afternoon. He would’ve wanted to go to school that day but he had to take care of the herd of goats. Together with his brother Juan José, Marcos spends the day taking the herd through the Sierra Morena Mountains and at sunset, it was time to return home. That afternoon, Lucero, his faithful dog, sensing danger, becomes restless and barks incessantly. Four wolves appear out of the dark and viciously attack the herd, killing five goats. In order to settle the debt, Marcos’ father sells his son to Don Honesto, the owner of the herd. The young boy is taken to the Valley of Silence, a remote area in the Sierra Morena Mountains, to help Atanasio, an old goatherd who lives in a cave isolated from the rest of the world, ever since he lost his family during the war. Thanks to Atanasio, Marcos learns the secrets of living in the wild: hunting, setting traps, tracking, harvesting… and a very special friendship is born. For the first time in his life, Marcos feels he is taken care of. One morning, the old man grows ill and dies in Marcos’ arms a few days later. The young boy is left alone and totally isolated, with the exception of a small herd of goats, an Eagle Owl who sleeps at the entrance of the cave and Minero, a ferret that Atanasio used for trapping rabbits. Minero will become the young boy’s pet. Together, in their lonely world, they form a family. However, Marcos needs a friend, someone who will remain with him amidst the cold winter nights, someone who will help him hunt, someone who will play. That someone will eventually appear in the form of a wolf, Lobito, a four month-old cub that will change Marcos’ life forever. 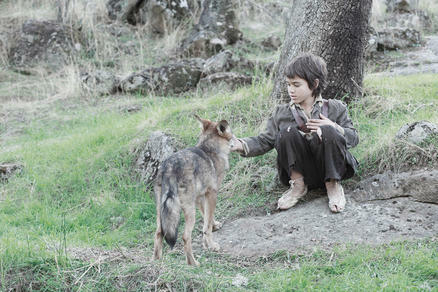 The years pass and Marcos continues to live isolated in the Valley of Silence, next to Lobito. He is now 20 years old; his hair has grown long and is dressed with deerskin. He has become yet another wild animal. His happiness suddenly comes to a halt. Ceferino, Don Honesto’s foreman, accompanied by four Guardia Civiles, gets a hold of Marcos as they chase Balilla, a fugitive on the run. A Wanda Vision Production, in co-production with Arakao Films (Cordoba) and Sophisticated Films (Berlin), 2010.